Welcome to the God Calling website! If you are unfamiliar with this daily devotional, you might enjoy reading the back story of the book. You’ll find the story of the authors, Two Listeners, in The Voice Divine. You’ll find the story of the editor, A. J. Russell, in The Story of the Book. The original God Calling was first published in 1935 in England. God At Eventide is the evening devotions from The Two Listeners. We’re very excited to be able to share Dr. Maurice Berquist’s book The Miracle and Power of Blessing with you on these pages. This is copyrighted material shared here with the permission of his family. We are thankful for their generosity in allowing us to share this life-changing book, one of our long-time favorites. We have loved this book for years, have given out many copies to friends and other disciples searching for a closer walk with our Lord. We encourage you to take the simple message here and experiment with this concept to prove it’s truth in your own walk. Our own adventures with Dr. Berquist’s ideas have brought blessings and miracles into our lives and those around us. You’ll also find some Classic Christian Books here. Most of these books are in the public domain, and are not copyrighted. There are a few exceptions, clearly marked as being on our site with the author’s permission. We invite you to use the public domain books you find here freely within your ministry. Copy them, print them, refer your friends to the website. If you would like to receive the daily devotionals by email, just fill in the SUBSCRIBE form on the left navigation panel of each page. You’ll get a confirmation email of your request. Respond to that confirmation, and you’ll begin receiving the free emails each day. We have no advertising, no sales or promotions on our site or in our emails ever. Blessings to you and yours this day and always! our emotions will distort our interior space. you can do much to help yourself by deliberately going outside of them, especially into nature where everything you see draws upon God’s strength. The same strength we seek directly from Him. Everything will be okay because He promised us it will be. All is well. I absolutely LOVE this dear little book! I’ve enjoyed reading it daily for 17 years now, and it continues to touch my heart each day as I read it. I can’t imagine not reading the “God Calling” devotional to hear what He has to say to me. I need to order a new copy, as the one I have now is in really bad shape due to daily reading over the years. I love the God calling book. I have had it for 30 years. It is tattered and falling apart! Thanks for putting these online. They really are a treasure. I love the pictures you have added. If these 2 ladies only knew what delight many would benefit from this book! A lesson for us. Keep the faith! Jesus IS Lord! I just read all the postings and found them most refreshing. This is my first visit to your website. My smartphone pull up your site when I was conducting a search for information on A. J. Russell. I’m blessed to own a copy of God Calling in paperback, it looks to be as old as I. Enjoyed the site, thanks for the divine connection. I’ve had my book for almost 20 years still can’t put it down.How do I purchase one for a gift and I also need a new one,my paged are torn.zThid book guided me in some bad times in life,when I felt like giving up . Great and Marvellous are thy works, O’ Lord God Almighty. Just and true are thy ways, O’ Thou King of Saints. And who shall not fear thee and glorify thy name, for thou only art holy. And all nations shall come to worship before thee. And yet again TODAY, Abba has whispered to me because I felt drawn here. The church I attend has a bit of turmoil going on right now, and today’s reading (February 17) was the one I needed to get me past the initial fury I felt at some of the changes. More to the point, YESTERDAY’s Eventide (February 16)reading did exactly the same, and I thank my Abba that “He Changeth Not”. I agree with reading when you are called, for it is true for me. Amen. Try this: Only read it when led to! Although it’s a wonderful daily devotional, I have found it INCREDIBLY valuable for specific direction or guidance from God. I have learned to ONLY read it when I feel prompted to. On days that I’m unsure, sometimes I wait for Him to nudge me twice that day. With so many specific messages such as “Wait” on June 18th, or “Go forward fearlessly” on June 22nd, I found I’d rather have that form of specific direction every few months than a good message every day. Just a suggestion for everyone else. Give it a try! Only read it when you think about it. Some days He might surprise you with a message that seems to be written just for you! Honestly, Our Lord disciplines those He loves. I was reading an account of a soul who died and went to hell. This soul rejected God’s graces all her life. It was interesting that she never suffered sickness or doubt or anything like you are going through.It was as if her unfaithfullness didn’t deserve to suffer and be brought closer to God.Truly, when God sees we love Him He allows what draws us closer and eventually rewards the soul unlike the one who rejects Him who smiles and laughs all the way to hell. Absolute Surrender is one of my all time favorite books! Enjoy! I just read the first chapter of Absolute Surrender. Andrew Murray and the inspirational Oswald Chambers are two peas in a pod. Talk about like philosophy. I don’t know if one influenced the other, but they are both spot on. Amber. You are always His. Perhaps, we forget Him . Then, darkness enters. A friend of mine gave me this book. It’s been a blessing to me, I’m going to buy some copies of it and give to friends and family members. This book truly has given me a new growth in Jesus Christ. Thank you for this wonderful book, I love it. Hi Amber, I just read your message on this site, this is the first time I’ve looked. 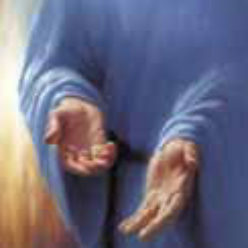 Maybe if your ask God what is causing all the troubles, & ask Him to give you Spiritual ears & eyes to see,& understand. That may help. You can get a print copy of God Calling at many bookstores, including Amazon and Barnes & Noble. Christian bookstores also carry it. The extended version or the journal have the scriptures to go with each day’s devotional; the paperbacks generally do not. Please, where do I get a copy for myself too and perhaps for others? Maybe I should check Amazon? Thanks soooo much dear Michelle. This has been sooo useful to me as well. In this spiritual journey, there are some good days and bad days too. As humans, we tend to incline to our senses more and more, it takes deliberate effort to hang on to the spiritual, and trust me, some days are cloudy and seem impenetrable. ….but as I often tell people around me, his grace is ever sufficient. That is the phrase I hang on to at such times @Amber. Your story touched my heart, as I have been a Christian for about 43 years. Your situation is not unique. The still small voice is ever present, even when you are not aware of it. I often felt like you, that God was not speaking to me. Rememeber what the word says (please read these for yourself) Joshua 1: 8; Hebrews 13: 5b; Matthew 28: 20b, that the Lord promised us that He would never leave us or forsake us. We need to receive this truth by faith and act as though it is ever present! The Word says in 1 Kings 19: 11 & 12, “and after the fire a still small voice.” Very often the issues of life get in the way to distract us from abiding in the Vine! “The thief (enemy) comes only to steal and kill and destroy.” (John 10: 10). Beware of Satan’s tactics, He will do anything to weaken your faith and trust in the Lord, As the Lord said to Joshua in Josh.1: 8, “Do not let this Book of the Law depart from your mouth (i.e. this means you need to speak it); meditate on it day and night, so that you may be careful to do everything written in it. Then you will be prosperous and successful.” Remember too that “Death and life are in the power of the tongue.” (Proverbs 18: 21). I really hope that you are able to receive these truths and know that the Lord is ever present and is ever more ready to communicate with you than you are to receive! Many Blessings in Jesus’ Name. Eion Watson. Thank you for taking time out of your busy lives to offer hope. The support you have provided me shows just how much love and faith is still alive in our world and it makes me happy beyond words. Please know that I have read each of your posts many times and I have felt peace in my heart. God brought me to this site and I know deep down that everything is going to be okay. While I still struggle daily to reconnect with our Lord, I know He’s always there as many of you have said. He was there for me in the past and I know He will be there for me every day I have left on this earth and beyond. May God bless all of you. You are angels on earth. This all means you are on the right path! From what I’ve learned God’s devoted servants all go through times of great trouble – and sometimes during those times God seems absent. Of course that’s not true. Coming through the dark times is what develops faith, endurance, patience – all essential qualities to live a spirital life and grow closer to God. I’ve learned more during dark times than good. “Faith is the assurance of things hoped for, the conviction of things not seen.” Hebrews 11:1. To me that means even though I can’t see God via signs, and can’t feel Gods presence in other ways, I have faith God is still with me and will give me the strength – one day at a time – to get through the hard times. And that I will once again get signs, feel God’s presence. God is burning the dross away from you so you can become the pure gold you are meant to be! And it’s a painful process to be sure! But for me, one that’s been the answer to my earnest prayers – to become closer to God and be an effective and loving servant . So I can love people who need love, help people who need help. And to be capable of greatl joy and peace. Being human I wish there were an easier way! But trust me: it will get better because you are becoming better! Don’t quit before the miracle! As the two listeners say all the time: fundamentally all is well. Love and laugh. In spite of it all! Good luck. Hope this has been helpful. Take what you like and leave the rest! Great advice, Michelle! Thanks for sharing with us your enthusiasm for the joy of loving Jesus. Thanks Kathryn! Have you read the Story of the Book, and the Voice Divine? You’ll find it very interesting to see who the Two Listeners came to write these fabulous devotionals if you don’t already know the story! You can find the links to those pages on the home page of our website. Hi Amber, I’m wondering if you have a copy of God Calling in writing? I’ve given many, many copies of this book to friends. Reading God Calling, a chapter in the Bible a day. (Psalms is great when I don’t feel he is listening), and Journal your thoughts, long or short doesn’t matter. He is always with us…. Whatever you do don’t give up! Thank you for your prayers and kind words. It is a helpful reminder to know others have gone through these ups and downs too. I am 29 years old and struggling with many unpleasant situations in life that have burdened my heart. I am trying my best to lean on God and give Him my full faith and trust that everything will work out for the best. Carol suggested I write down a scripture everyday and memorize it. I think today’s best one would be Hebrews 11:1 “Now faith is the substance of things hoped for, the evidence of things not seen”. What you’re feeling right now is what a lot of people have felt. Remember that God is always with you, in both the good times and the bad. He will never give you more than you can handle and he is with you every step of the way. Believe me, he hears everything you say to Him. Keep close to Him and He will work everything out for you. I will keep you in my thoughts and prayers. Remember, God is good every day! May God bless you this day and every day. Thank you Carol and Val. Your words mean so much to me and bring happy tears to my eyes. It has been a struggle, but I know one day the clouds will part and the sun will shine again. I like the idea of memorizing one scripture or spiritual thought each day. In fact, I bought a sticky pad to keep them on my bathroom mirror to read each morning. Thank you for your kind messages and keeping the spirit alive. I will continue to Be and breathe throughout each day and not give up on Him. thanks for having the courage to speak honestly about the valley you are walking in at the moment. I think many of us could give a testimony like yours in that we have been through similar times, and it DOES get better. I would encourage you to spend more time in the Bible now, even if you don’t feel like you are in the Presence of God. You are. You always will be. He has promised he will never leave you or forsake you. I would also encourage you to memorize a scripture every day that means something to you at this point in your life. Say it out loud or think it many times during the day. Scriptures of praise will chase away the darkness. Do you have a pastor or a church family? Your instinct to share where you are right now is exactly the right thing to do. I am sure there are others who can share their best defenses they have used as well. I would encourage other Listeners to chime in with their best ideas. I am praying for you! I am so thankful this site is back up. I have been going through a very rough year and have to admit that I have become angry with God lately. My life continues to receive one bad thing after the next. I’ve been a devoted Christian for about 8 years and I truly miss the days when God used to talk to me in His own way and show me signs that everything was going to be okay. I still pray night and day, but it feels more like I am talking to myself. I feel distant from our Lord and I am struggling with it everyday. If anyone has any suggestions to help me address this issue I would love to hear them. All I can hope is that “all is well” as the book says. Thanks, Teri, for sharing your journey with us! I love your idea of passing on your book to your grandchildren. What a legacy of love to pass along! I’ve been reading the book, daily, for 22 years. My husband joined me four years ago when I found this copy electronically. We are now grandparents, and I cannot wait to pass on my old tattered, notated copy to our grandchildren. What a beautiful idea, thank you!! Thank you, to this blog for the devotional -after 35 years of marriage our relationship is stronger and far more connected to God because of you. May God bless you!! Like many soul searchers I too have been reading & following guidance from God Calling since 1991 a dear work colleague Janet Lewins bought my copy as we commuted to ICI Wilton as part of our University placements. God is at work in you and through you! Thank YOU and, those working with you for “listening” to him and following through with the work of this ministry by having this web site available to all! It’s just like God to have prepared our hearts so amazingly that, each days devotional is just what we need individually! **Please let me know where to send a donation for this ministry! I tried using the address on the old web site but it was returned. Thank you Carol and may God continue to bless you all. I can only imagine what a treasure your Grandmother’s notes in the book she gave you must be to you! Thanks for sharing your story … it is so easy for us to forget the impact sharing these messages have on lives of people in our paths. Your reminder helps us keep our focus on the importance of sharing! I think God for this book. I was given a copy of this book by my grandmother when I was moving out of state. I placed the book aside and forgot about it. Years later my grandmother passed away. In my grief, I searched for the book, as she had written notes inside. Upon reading the devotionals, I discovered that they were and are tailored to my daily life! Each devotional is exactly what I need that day! It has been fifteen years and I continue to be Blessed by this daily miracle! I cherish that book and now use the website in order to preserve it. I thank God for my Grandmother and Two Listeners! Carol, I love reading this entry above, about God providing you with helpers to rebuild the site. My husband and I read God Calling most days and while we have the 2 books (for morning and evening), its lovely being able to read or reread it on line on our phones, where ever we are. Living with Jesus each day is a privilege and such a joy. Whatever is going on in us or around us, He is with each of us who draw near to Him and love Him. God bless you and your helpers! Thanks Carol and yes, I live in North America. Do you live on the other side of the international date line? One of the things I have not been able to do is send the devotionals to our listeners across the date line a day earlier than to the listeners in North/South/Central America. I will do some research to see if I can find a cure for that issue. I love God Calling and have been reading it since 1995. I like getting the devotion sent to my email, that way I can read it when I’m not at home. Since the update on the website, I’ve been getting the devotions a day late. I know you are still working on the website, but is there a way I can get them on the day of the devotion date? Thanks, Marita. I must tell you God has sent some of our listeners to help with rebuilding the site. If you’ve noticed the new fabulous photos, please remember to pray for the listeners who have provided those as a ministry. I’ve had some technical help from one of our listeners as well, in managing the steep learning curve for WordPress. God reigns in my life, and provides all I need to do His work. Thanks for ministering to those around you by sharing these fabulous devotionals with those God puts in your path. On Good Friday, I would like to praise and thank our Lord for all the good you and yours have done, Carol, through the God Calling devotionals in my life and those I have shared them with. Thanks for sharing with us, and for your encouragement. I am so gladdened to have been introduced to the website of thetwolisteners.org. I have been hooked to it ever since then, the spiritual upliftment I experience is beyond description. May you really be blessed Carol and co.
God Calling has been with me for years (in print and via email), and each day’s words have enriched my spiritual life immensely. I have forwarded or quoted many passages for friends who were in need of comfort and encouragement, and have recommended they’d buy the book or subscribe to the web ( which they did). Thanks for faithfully spreading God’s word. It’s a tremendous gift for many! I love the new look of the website ! Thank you for providing these devotionals for many years ! I am a christian counselor and use refer clients to your site. I am also a photographer and love the stunning images on the website and the new look ! Let me know if you need any royalty free images, I would be happy to provide. Thanks,James. You can find all of the March God Calling and God at Eventide devotionals on our website. We’re working to post April devotionals and get all the books back to the site. I should have everything back in place soon. In the meantime, I will do my best to stay out in front of the current devotionals. We would like to know how inspirational the God calling at eventide has been in our daily devotion. We have felt the guidance through the holy spirit. We will truly be looking forward to a repost of this truly inspiring book soon!!!!! We thank you for your devotion in trying to bring blessing to so many people trying to draw close to God such as ourselves and so many others we know. So we hope you will be blessed with time to repost. Again we thank you and God speed. Hallelujah!!!!! Just visit the site at http://www.twolisteners.org. You’ll find some navigation links on the left side of the page. click the one labeled “Posts – today’s devotional.” That will take you to the blog with the current devotionals for God Calling and God at Eventide. You’ll able to see the last two or three days of devotions. For others, click the links to God Calling or God at Eventide on the left side of the home screen. Please note, NOT ALL those devotions are loaded yet. I am working on them! How Do I find the blog pages, to read your daily devotional ? Thanks for sharing your testimony, and your book with your friend. I found the God Calling book at a thrift store, and I bought it immediately. While I was reading through it, a friend of mine and her husband came up on a Health crisis. The devotional for that day was one that I knew would touch her heart. I went to the web to see if the book was available online, and low and behold, it was! We have loaded Love Can Open Prison Doors to the books page for you. You are welcome! If you know of other great books in the public domain that we might add, please send us a note with your suggestions. Thanks, Patty. This is the very purpose of the ministry in keeping this on the web, free for all who need the blessings that come from the devotionals. I agree with you completely! Thank you for providing such wonderful literature and inspiration ! Thank you so much for all your efforts to put God calling in a place that is so accessable .I inherited my copy from my late mother and it has got me through hard times.Unfortunately that precious book was lost but to be able to pick up daily readings on my phone has been a real blessing . Dear Carol, Your commitment to administer comfort and knowledge to others really touched me. Not to mention the countless others that your previous website and this new one is touching. I have been going to your website for so long I can’t remember – it has been a source of comfort and blessing to me – and I know there are many others. And you have now taken the trouble to start a blog a on WordPress so send them directly to our emails, even if you’re so new to WordPress. How can we ever thank you enough? I know God sees all this with His eyes of love on you and is blessing you for your efforts – we bless you, Carol from our hearts with much gratitude! may you always be blessed for your ministry ! I’ve been reading your website for almost 10 years I think. I’ve background in WordPress administration. Is there anything I could do to help? Thanks for being part of the God Calling community! I have the books God Calling and God Calling at Eventide, but sometimes forget to pick them up. Thank you so much for your daily postings. They remind me of my purpose. Hi, I used to come here for God calling readings but can’t find them anymore. I also want to read “The Miracle and Power of Blessing” but can’t find it either. Has the link been changed?